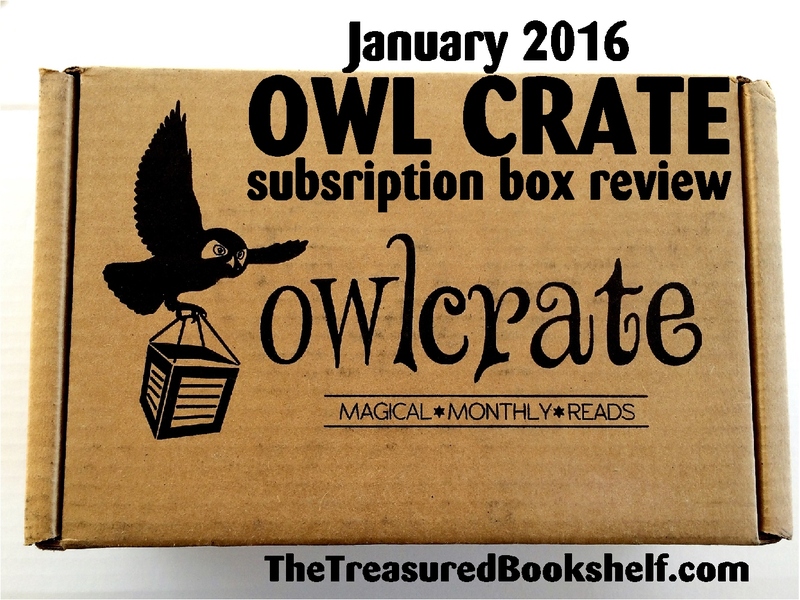 Enjoy a new book and lots of great book fandom with this Owl Crate subscription box. In January 2016, we received some great items to keep us reading and decorating our library in style. I have recently fallen in love with subscription boxes. I love the magic of opening up a new box and finding all kinds of fun items that would not normally have popped up on my radar. 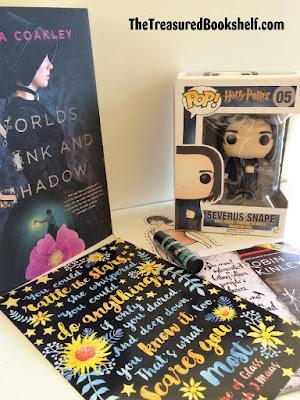 I decided to try a new subscription box every month to find some new and exciting fandom items as well as wonderful things to read. Owl Crate is a monthly subscription box filled with wonderful things for readers of Young Adult books. I am a huge fan of clean, adventure filled young adult books so I thought this would be right up my alley. 1) No one is too old to read YA. 2) We will not be ashamed of our TBR piles. 3) It's okay to fall in love with fictional characters. 4) The book is always better than the movie (but the movies are fun too!). 5) Books have the ability to change our world. Isn't that great? I should have that printed and framed in my library. I have been in love with way too many fictional characters (yes, my hubby knows of my love affairs) and if you have looked at this blog at all, my TBR pile is out of control. I admit I was a little worried about the price when I ordered my box. That's a lot of money for me to cough up without knowing exactly what I would get. "There are three different plans to choose from. Month-to-month plans are $29.99 plus shipping, and you are billed each month. 3-Month plans are $28.99 plus shipping per month, and you pay for all three months upfront. 6-Month plans are $27.99 plus shipping per month, and you pay for all six months upfront." Now let me show you what I got and you can help me decide if it was worth it. 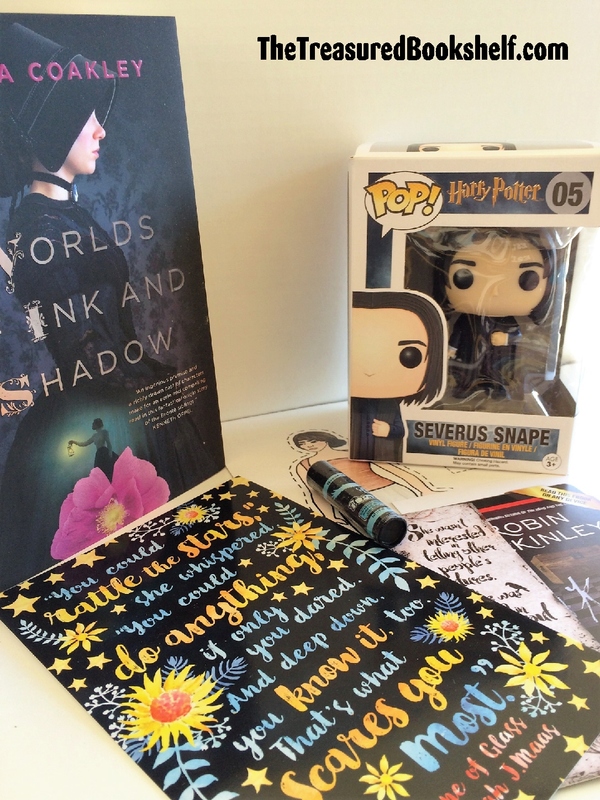 The theme of the January 2016 box was "magic" with a strong hint of Harry Potter. I love Harry Potter and was hoping for some amazing fandom items and a good book to read in that genre. I was super excited to get a full sized POP figure from the Harry Potter set. I have wanted one for so very long but I just couldn't justify the price for a collectible that would have to be moved around with us the next few years. So I was thrilled to get one in the box. 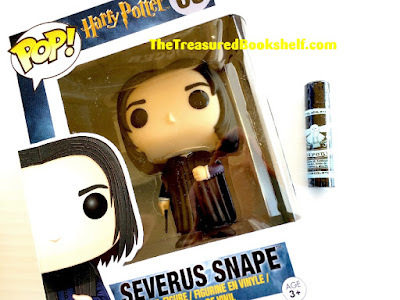 I'm not sure I would not have bought Severus Snape. I would rather have had one of the main characters, but I'm still super happy about having him. I can't decide whether to take him out of his box and enjoy him on my bookshelf or to keep him wrapped up safe and sound. Is that bad? The lip balm is a Patronus Lip Balm from the Geek Fire Labs. It's a mint chocolate flavor which is appropriate for chasing the dementors away. After putting it on, the balm is a little more waxy than I regularly like, but I love the smell of it. And after having it on for a few minutes, you can barely tell the waxy feel. In the Owl Crate box, there were two beautiful prints from Evie Bookish. I have only recently heard of her and started craving some of her artwork. So I was thrilled to be able to get a 4 x 8 inch quote print from the Throne of Glass by Sarah J. Maas. I haven't read this book series myself, but it's on my TBR wish list so maybe soon. 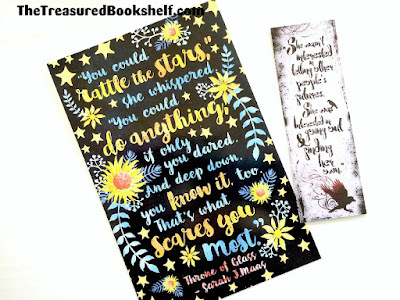 The bookmark is also beautiful and is a quote from The Raven Boys by Maggie Stiefvater. This is a series I haven't even heard of yet, so I'm excited to learn about it. The quote is beautiful and reads "The Trees Speak Latin" on one side and "She wasn't interested in telling other people's futures. She was interested in going out and finding her own." 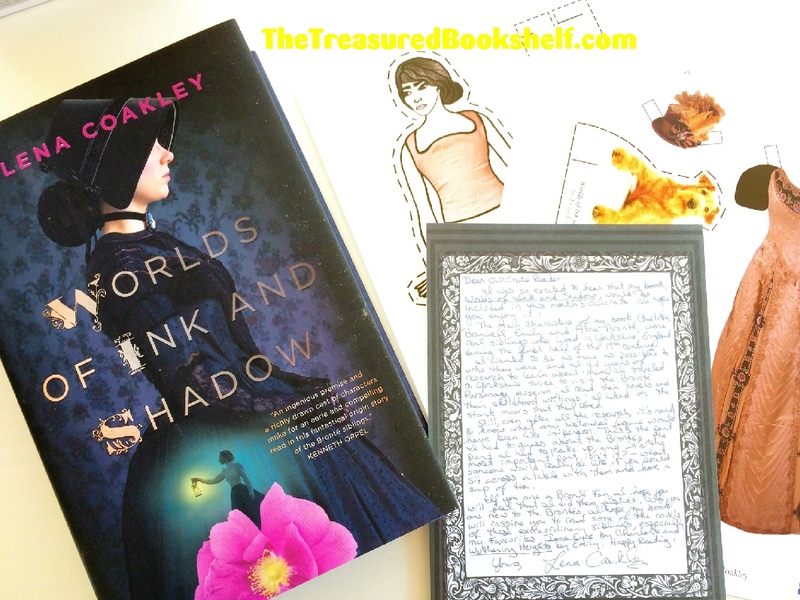 The actual book that was included in the subscription box was Worlds of Ink and Shadow by Lea Coakley. It was cool that the book came wrapped in a plastic sleeve to protect it. It also had a note from the author and some paper dolls. How cool is that? "Charlotte, Branwell, Emily, and Anne. The Brontë siblings find escape from their constrained lives via their rich imaginations. The glittering world of Verdopolis and the romantic and melancholy world of Gondal literally come to life under their pens, offering the sort of romance and intrigue missing from their isolated parsonage home. But at what price? As Branwell begins to slip into madness and the sisters feel their real lives slipping away, they must weigh the cost of their powerful imaginations, even as the characters they have created—the brooding Rogue and dashing Duke of Zamorna—refuse to let them go." I know that getting a subscription box brings with it a surprise element that is both good and bad. It's hard when you get things you wouldn't normally buy, or if you already have the book included. But it's also fun to get things that you would not normally buy yourself. I'm not sure I would have bought this book, but I look forward to reading something different than my normal fantasy fiction. Over all, I think I'm happy with the purchase but I haven't decided for sure whether I will purchase net month's box or not. The theme is Sci-fi Love which interests me, so I am seriously tempted, but we'll see. What do you think? Would you have tried this box if you knew what was in it? Or do you like the mystery? Would you try this month's Owl Crate Darkness theme? You only have a few more days to decide.